In the upcoming successor to Windows 7 - Windows 8 - users will no longer need to install third party applications to access ISO and VHD files. In a blog post, Rajeev Nagar, group program manager on Microsoft's Storage & File Systems team announced that Windows 8 will natively support mounting of ISO and VHD files. Steven Sinofsky of Microsoft said that these features are frequently requested features. In continuing with the improvements in core Windows functionality and also oft-requested features, we are adding native Explorer support for ISO and VHD files in Windows 8. While terabytes of storage are available to all of us, managing disk (or disc) image formats remains important for a number of mission-critical operations in many organizations and among power users. We know even more support for VHD is a big request, so stay tuned. ISO files are image files of CDs or DVDs. To access the contents of an ISO file, users in Windows 7 and earlier versions of Windows had to either burn the ISO on a CD or DVD, or use third party applications such as Daemon Tools. VHD (Virtual Hard Disk) files are images of hard disks. Like ISO files, Windows 7 and the previous versions of Windows do not have the capability to access the contents of a VHD file directly. 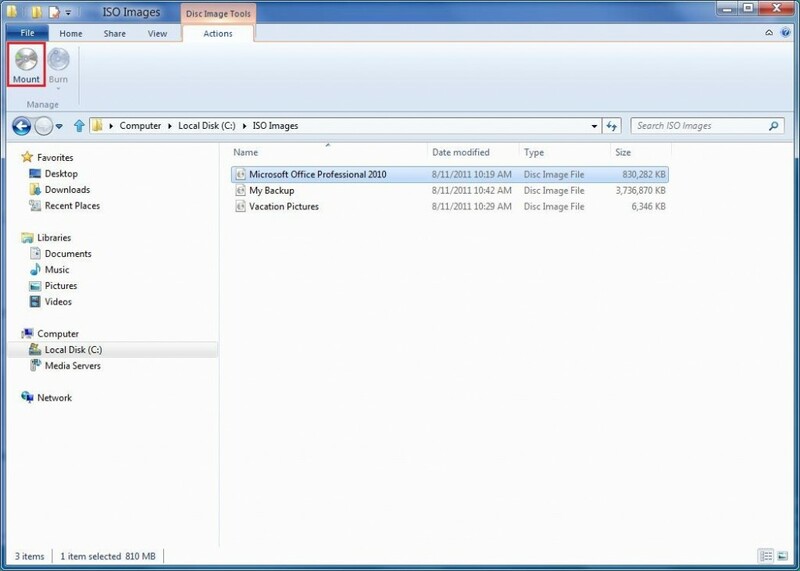 In Windows 8, however, users can mount an ISO file by simply double clicking on it. As in the third party applications, after mounting the ISO it will show up as a CD/DVD media. Users can access the data in the ISO as they normally do. When they are done, users can unmount the ISO file by clicking on Eject. Using VHD file too is as simple as using ISO file in Windows 8. Like in the case for ISO file, users can simply double click on the VHD file to mount it. Unlike ISO, however, VHD files are mounted as hard disks - after all they are hard disk images. Users can access the mounted hard disk - read contents, delete contents, modify contents etc. just like a normal hard disk. The VHD file can be unmounted once work on it is finished by clicking on Eject just like the case with ISO files.